Camera shot from behind courtesy G. Pinto. As the new year unfolded a couple of weeks back, I gave up on alcohol and fireworks related injuries and give some love to the emirate of Ras al Khaimah. The goal was to ride the predominant Jebal Jais and catch a glimpse of the first sun of 2017. Peaking at 1911m, it is the highest mountain in the country. The call of Jebal Jais is in a stretch of very well maintained mountain road leading to an altitude of 1280m, which makes it roughly 70% to the summit altitude. The paved road stops there, beyond which is unpaved territory mainly used by construction crews working to extend the paving by 4km. 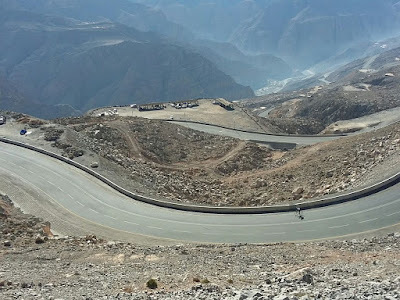 The actual peak of the mountain lies just across the border in Oman, thereby making the current official stop of the paving just a slope of this local giant. Where I typically start this climb from is a non-descript spot near the junction of Wadi Bih and Jebal Jais road at 25° 49' 16.69" N latitude and 56° 6' 46.32'' E longitude. When I arrived at 6:00am, the sky was in transformation, enough to faintly display the outline of the Hajar range around me. At quarter to 7, a friend showed up and we proceeded pedaling our bikes. About 1.6km from the parking spot, appreciable changes in gradient start to take place. I indicate this spot on the topographic map below. From here it is 4% grade average to the top. 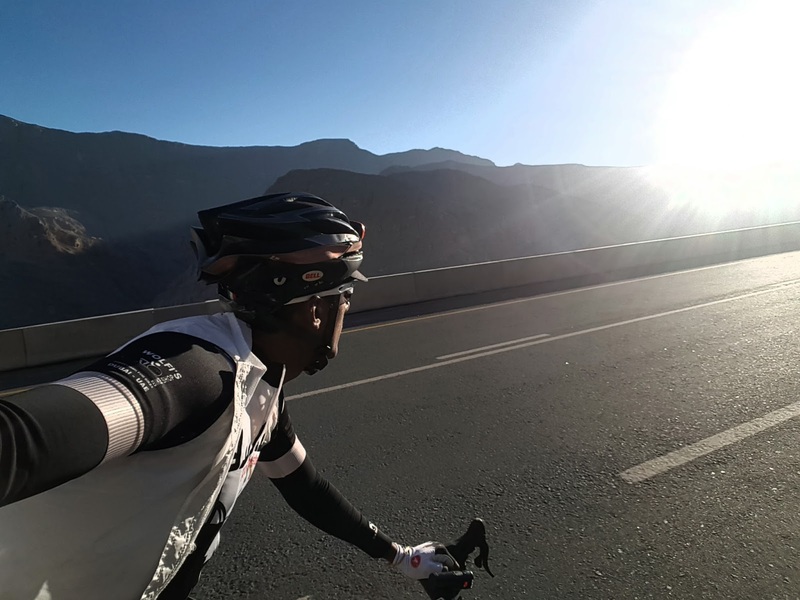 Regardless of where people consider the climb to start, I afford the mountain it's respect and count the initial stretches as part of the experience. The reason is that trying to keep a constant pace for the first 11km will elevate heart rate output as you gain around 530 ft in altitude. Spatial grade change is indicated below. Speed gradient of the ride follows, which shows that I try to keep a constant, but slower speed at the pronounced "knee" of the climb. The sea blue color indicates around 7.2-7.5 mph of average speed. During the descent, the neon green color indicates an average speed of 26 mph. Gradient change along Jebal Jais road, courtesy Climbbybike. The amusing bit is how different elevational information services can differ in their estimates of the vertical climb. GPS is nice, but it is inaccurate by +/- something. On top of that, the different services apply their own juicing algorithms to give you wide ranging numbers. The sun shone through at 7:05am. Whereas I thought that temperatures would dip to a comfortable 8-10 deg C on the slopes, it was around 5-6 degrees warmer. This made for an uncomfortable experience in arm warmers, which I would roll down at some point along the climb. At these temperatures, warm clothing is dangerous. First rays of the sun. The plot below shows skin temperature (light brown line) rising slowly but steadily from 37 degrees to around 40 degrees at the top. I'm not sure of the uncertainty in the measurement from the V800. Although I would not consider this as core temperatures, it gives an indication of how intensity steadily rises. It points to the challenge of maintaining a certain wattage input as your blood juggles the duty of powering muscles and cooling the core. Will lighter wheels make a big difference while climbing? It depends. The energetics of a rolling wheel involves a translational energy component as well as the effort to roll the wheels through it's rolling inertia, however torque to rotate a wheel is largely dependent on it's angular acceleration. Choice of lighter wheels are felt in quicker accelerations as opposed to slower accelerations. As one sees below, for the my ascent, acceleration (blue) was limited to 0.1 and more or less steady through the effort. In stark contrast, the descent had higher accelerations (2 units at the maximum) as I navigated out of switchbacks and sharp turns. A simple comparison is below, where delta in power between heavier and lighter wheels is more pronounced in higher acceleration scenarios. In this example, a higher acceleration is moving from 10kph to 40 kph in 7 seconds as opposed to 10. Comparisons in the reduction of required power based on wheel rolling weight. Most recreational cyclists climb and descend a hill at low accelerations. The wattage savings pale in comparison to the savings from shedding body weight. As a percentage of overall climbing wattage, the rolling resistance of the tires and the quality of road surface will equate to a larger proportion than less rolling inertia will. But I also said it depends. A point here is that higher up in altitude one goes, the amount of power as a percentage of sea level power becomes lower due to the reduced partial pressure of oxygen to burn fuel. At the current altitude of the Jebal Jais road climb, a non-acclimatized individual will, according to this model, see a net 16W drop from from sea level FTP of 250W as the physiological loss is greater than the gain in aerodynamic. An acclimitized individual will on the other hand only see a 9W drop. This fact may support the idea of carrying less weight and rolling weight to higher altitudes. To performance oriented riders, the "every bit helps" bit makes sense to them when human power is altitude derated to begin with. Net effect of altitude on cycling power. My lonely figure descending down this breathtaking mountain. The goal on the descent is to keep the head up and brake before the turns using "pumping action" of the brakes. I've never ridden tubulars down this mountain and probably never will, given the hot temperatures and the unknown consequence of heat and glue dynamics. 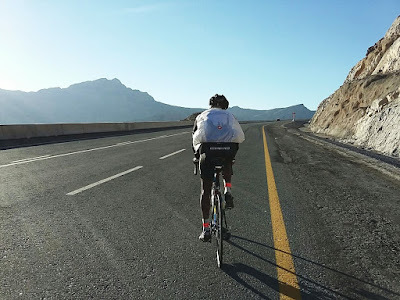 My suggestion is to ride clinchers if you are unsupported. We liked coming back to the parking lot after 3 hours in the saddle. The morning was celebrated with some chilled coca-cola and the beauty of the mountains around us. A day well spent. It is rumored that the 4km extension to the mountain climb will be completed this year and opened to the public. I look forward to the opportunity to experience the mountain in it's entirety. We'll have to wait and see how work progresses.